BATAVIA, N.Y. -- Community College will be the proud albeit temporary home to the "Frederick Douglass from Slavery to Freedom: The Journey to New York City" exhibit from October 17 - November 14, 2018. During this time, the entire community is encouraged to visit GCC's Alfred C. O'Connell Library in Batavia to view this famous traveling exhibit, learn about Douglass's incredible contribution to American history, and enjoy the auxiliary events and opportunities that reinforce the display. "Frederick Douglass from Slavery to Freedom: The Journey to New York City" was developed from his autobiography, Narrative of the Life of Frederick Douglass, an American Slave, by the Gilder Lehrman Institute of American History. The exhibition was curated by Susan F. Saidenberg. It has been displayed at schools, museums, libraries and historic sites across the country. "We are pleased to have been selected as a site for this exhibition," Cynthia Hagelberger, reference services librarian at GCC said. "The exhibit showcases digital reproductions of letters, photographs and broadsides that depict the life and legacy of Frederick Douglass. We hope this exhibition will help all who view it to gain a deeper understanding of Douglass' quest for freedom and the difficult choices he made. It is a perfect opportunity for school age children, teenagers and adult of all ages to appreciate his living legacy." Further details about the exhibit, associated events and teaching and learning resources are available at GCC's Library webpage at: https://guides.genesee.edu/douglass2018. Anderson, a founding member of AKWAABA - The Heritage Associates, Inc., has dedicated his life to infusing history into contemporary families. He is the author of The Origin of Life on Earth: an African Creation Myth (1992) and Rebellion of Humans: an African Spiritual Journey (1994) and plays an active role in Kwanzaa celebrations in Monroe County, NY. Annually, Anderson helps produce "On Behalf of Those Who Lie in Yonder Hallowed Ground" - a public tribute to especially African American Civil War Union soldiers. In December 2017, Anderson was appointed to the Frederick Douglass Bicentennial Commission by U.S. Senate Minority Leader Charles Schumer. To accompany the excitement of the exhibition, GCC will be holding a dynamic essay writing contest for Genesee Community College students. The contest requires students to research a social injustice in today's world and produce a minimum of 600 words that address either of two specific essay questions. Details are posted in the exhibit library guide at https://guides.genesee.edu/douglass2018 and the deadline for submissions is Wednesday, November 14, 2018. The crescendo of this multifaceted program honoring one of our country's greatest heroes is one of the finest impressionistic lectures by the man himself. 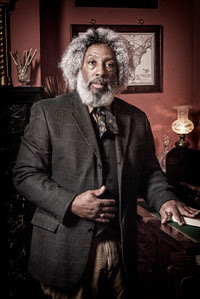 GCC has invited Frederick Douglass - in the form of accomplished performance poet and published author, Nathan M. Richardson - to share his story. On Wednesday, November 7, 2018 at 7 p.m., in full nineteenth-century dress, Richardson will bring his Frederick Douglass Speaking Tour to room T102 in GCC's Conable Technology Building. This event is also free and open to the public. Seating is limited. Funding for these events has been provided by the Gilder Lehrman Institute of American History, the Alfred C. O'Connell Library, GCC's student club WOKE and GCC's history club. Details about this and other events sponsored by GCC's Historical Horizons history club are available at https://gcchistoricalhorizons.wordpress.com/.